One of the most significant sources of information about farmers’ thoughts on current issues, the Iowa Farm and Rural Life Poll, has just been released. This poll, conducted by the Iowa State University Extension Service, surveyed more than 1,000 Iowa farmers on a wide range of issues key to agriculture policies. The poll found that nearly seven in 10 farmers believed that climate change was occurring, although within this group the farmers were divided about whether the cause was human or natural. More than two in five farmers were worried about the effects that climate change might have on agriculture in the state, but nearly half believed that crop insurance programs would protect their farm in the event of a natural disaster caused by global warming. The poll also revealed Iowa farmers’ thinking about what steps should be taken to respond to the threat of climate change. The highest-rated response was that seed companies develop crop varieties that resistant to changes in weather patterns. Additional steps by farmers to protect against increased precipitation and improve drainage systems were also rated highly. In contrast, the farmers polled had less interest in having federal or state government initiate policy changes to reduce greenhouse gas emissions or other causes of climate change. Continuing to investigate the topic of climate change, the poll also interviewed farmers about which sources they most trust for climate change information. The results showed that they trust the University Extension most highly, followed by scientists, farm groups, and family and friends. Farmers were also asked if they were familiar with various federal conservation programs. Out of all the programs, farmers were most familiar with the federal government’s Conservation Reserve Program, which 96 percent said they knew about. 46 percent said they were current participants. The second most familiar program was the Continuous Conservation Reserve Program, another federal program which targets high-priority environmental concerns. This program was known to about four in five farmers, and one in five people were currently participating. 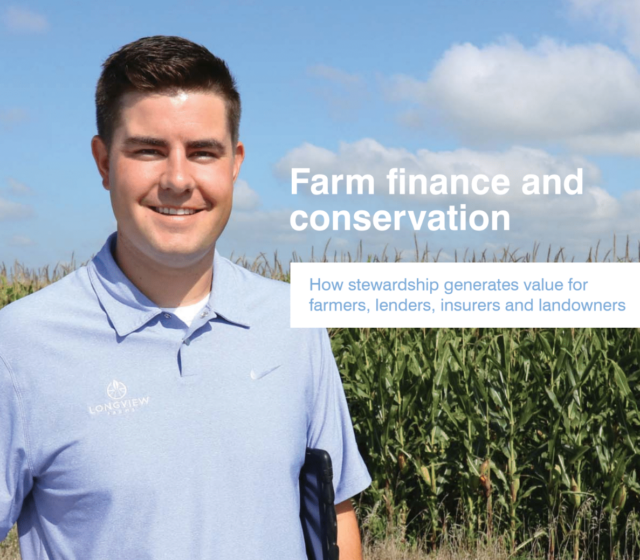 At the bottom of the list were the Conservation Reserve Enhancement Program (CREP), Resource Enhancement and Protection (REAP), and low-interest or no-interest loans for Agricultural Best Practices, with less than 10 percent of Iowa farmers participating in both of these programs. In evaluating the data, the Iowa Extension Service reported being struck by how unfamiliar Iowa farmers were with major federal programs, such as these and others sponsored by the USDA. In connection with the poll’s study of climate change issues affecting Iowa farmers, another major section evaluated the use of agricultural drainage on Iowa farms. According to the report, “much of Iowa’s land requires artificial drainage to allow crop production and/or improve yield potential.” The majority of farmers polled said they had spent at least some money on drainage systems in the 10 years before the survey. Of these farmers who had invested money on drainage, a majority spent $9,999 or less for their system. In an effort to gauge the farmers’ positions on current political issues, the survey also asked farmers about whether they thought particular taxes should be increased, decreased, or left alone in the federal budget, as a way to help reduce the federal deficit. Out of the five tax-related categories, the only one where a majority supported an increase was to increase income tax on the wealthiest Americans. Opinions on sales taxes were more balanced, with a majority keeping them the same, and more or less equal numbers supporting an increase or a decrease. Nearly half were in favor of decreasing property taxes, and about three in five supported a cut in estate taxes. The survey also provided a window into Iowa farmers’ thinking about national spending priorities: Of those surveyed, a majority supported either increasing funding for education or keeping it at the same levels. For social security, public health, and crop insurance subsidies, more than half of the farmers were in favor of keeping spending the same. The only programs of the federal budget that Iowa farmers wanted to reduce were the farm bill commodity programs. Interesting in many ways, the Iowa Farm and Rural Life Poll clearly shows the need for continued attention to issues of climate change as they affect farmers throughout the country. State extension services have a role to play in this regard, and as a trusted source of information on many issues for farmers. The report also demonstrates the problem of farmers not taking sufficient advantage of federal programs which might benefit them. What is the picture like for those of us in other states? The Iowa poll should help all of us raise questions about our own local situations, including how to increase awareness of critical issues affecting farmers in each of our states.